Active Care Group | Case Studies | FiC Co. Ltd. Active Care Group is the only Residential Care Services for Elders providing computerized medicine management system in Hong Kong. The effective and efficient medicine delivery ensures the reliable service to the residential elders of the group. 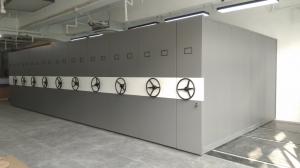 In order to collect and control of the huge data & information, a highly concentrated storage system is needed for their central filing. As a result, FiC proposed a steel movable cabinet set for them. All steel structure ensures the stability and reliable for heavy-loading storage. Besides, the safety device built for the mechanical control system also ensures the safety for the user. Since most documents is stored inside the cabinet, the bench table with on-top panel is a light weight furniture design, which is suitable for paperless working environment.